While Mopar lovers eagerly await the arrival of the rumored “Hellcat” Hemi powered Dodge Challenger that is expected to offer somewhere in the area of 640 horsepower - Hennessey Performance has put together a new package for the Dodge Challenger SRT8 that provides enough power for the brawny muscle car to take down the likes of the Chevrolet Camaro ZL1...at least in a straight line. While the Dodge Challenger SRT8 with the 392 cubic inch offers 470 horsepower and 470lb-ft of torque in stock form, Hennessey Performance has put together a version of their HPE650 package for the mighty Mopar muscle car that increases the output to 652 horsepower at 5,900rpm. The folks at Hennessey have issued the video below, showing the HPE650 Challenger in action on the dyno and on the track - although we don’t get any quarter mile times or anything like that other than the dyno numbers. While Hennessey advertises that this beast packs 652 horsepower at the motor, the new dyno video shows that the HPE650 Challenger SRT8 makes 525 wheel horsepower and 482lb-ft of torque at the wheels. The most significant components of the Hennessey HPE650 package for the Dodge Challenger SRT8 392 are the Magnusson TVS2300 supercharger, the high flow cylinder heads, a unique camshaft, an upgraded fuel system and an exhaust system that includes stainless steel headers, high flow catalytic convertors and a full exhaust system. In addition to the other items (fluid, a thermostat etc) needed to make all of the modifications work safely – the HPE650 package also includes a high performance engine calibration that is the final piece of the puzzle as the output climbs from 470 to 652 horsepower. Of course, what good is an ultra high performance tuning package if it doesn’t come with some aesthetic goodies? To address that issue, the HPE650 Challenger package includes red Hennessey valve covers, a Hennessey gauge cluster, embroidered Hennessey floormats, embroidered Hennessey headrests for the front seats and serial number plaques on the dash and on the engine. 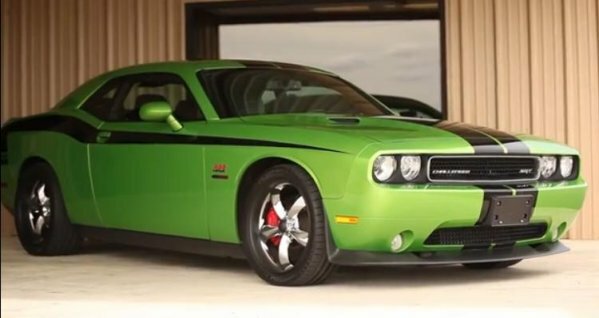 The result of this all is a modern Dodge Challenger that will put out enough power to out muscle the Chevrolet Camaro ZL1 and just a touch less power than the Shelby GT500 Mustang. Of course, if your neighbor’s Camaro ZL1 has some work done and the HPE650 package isnt enough to hand him his pride in a nice little package – Hennessey also offers a pair of turbo and engine packages that offer 725 or 800 horsepower. The main difference is that the HPE700 and HPE800 packages do away with the 392 cubic inch Hemi in place of a monster built 426 cubic inch stoker motor in addition to all sorts of other goodies. For a look at the Hennessey HPE650 Dodge Challenger SRT8 in action, check out the video below of the Mopar muscle car on the dyno and roaring down what we can only assume is a quarter mile. Make sure that your speakers are cranked up as the HPE650 Challenger sounds awesome while putting all of that power to the ground.